An armed man was killed in a shootout with police outside the residence of the Archbishop of Cebu in the Philippines yesterday. Source: Crux. The man, who arrived on a motorbike and was wearing a facemask and helmet, entered the residence and said he was looking for Archbishop Jose Palma, who was in Manila at the time. “The man appeared to be disturbed because he wasn’t clear on what he was saying. 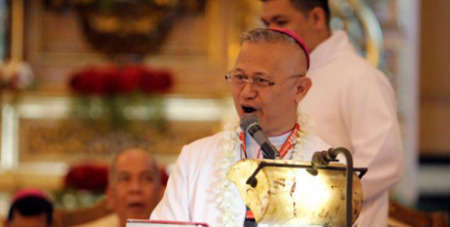 One of the secretaries of the archbishop noticed what seemed to be a firearm tucked in the man’s waist, prompting him to call the police,” Police Chief Superintendent Debold Sinas said, according to the Inquirer, a Philippines newspaper. “When we arrived in the area, the man was on board his motorcycle. Our operatives tried to approach him, but he said ‘Don’t touch me’ before he fired at us,” a police officer on the scene told the Inquirer. Archbishop Palma has been an outspoken critic of the growing violence surrounding the administration of President Rodrigo Duterte, who has led a war against drugs that has been marked by extra-judicial killings of drug dealers and others. The archbishop was in Manila for the Plenary Assembly of the Catholic Bishops’ Conference of the Philippines, which issued a strong statement aimed at the regime. The Church has been a constant target of Mr Duterte, who has warned against the bishops’ “creeping influence” in the country. Since December, three priests have been gunned down in the country. The Philippine Bishops concluded their plenary meeting this week by calling for three days of prayer and penance to call for justice “on those who have blasphemed God’s Holy Name, those who slander and bear false witness, and those who commit murder or justify murder as a means for fighting criminality in our country”.